I’ve got the feeling that everybody has to deal with this problem at some time in their life, but lately it seems like cockroaches have launched a personal vendetta on me. Kristi and I have been pretty lucky in our apartment so far. There were a few times when we first moved in that we saw a couple of roaches. We bought some bait traps at the Stop & Shop, and bang, the problem was solved. This year, though, beginning in about January, we’ve had cockroaches in our kitchen, and the bait traps aren’t working on them. Of everything in the bug kingdom, I think I find the cockroach the most loathsome, and I suppose it’s because of the associations that come with cockroaches. Ants are portrayed as industrious team players, spiders are crafty, but cockroaches are seen as just plain dirty. Our kitchen was being taken over by the small German cockroaches, their brown, shiny bodies skittering away when a light was turned on. We researched roaches on the Internet, and at first dusted all the cracks on our counter with boric acid. The things weren’t dying off quickly enough, though. 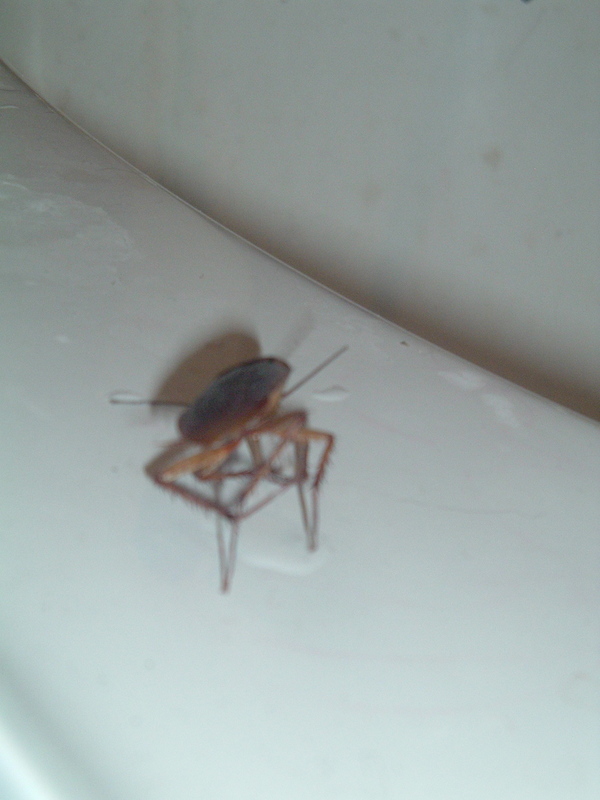 We scrubbed down our cabinets with bleach and enforced a strict no-dirty-dishes policy, but the little bastards still kept coming. I read that after cutting off the roaches’ food and water supply, it can still take months to wipe them out completely because they will start cannibalizing each other. Fabulous. Kristi decided that enough was enough and got a hold of some roach foggers. It was time to bomb our kitchen to kingdom come. She came up with the idea of putting plastic over the kitchen doorway and staple-gunning the tarp in place. This doubly functioned to keep us and our kitties safe from the poison and to prevent the roaches from escaping it. My skin was crawling afterward, and Kristi went to the sealed-off doorway to check on the fogger’s progress. She called me in to see the bodies of about forty or so roaches on the plastic tarp; they had died trying to escape. We watched another show before going to bed, and I periodically went into the hallway to view those dead bodies, torturing myself. The next day we killed a few slow-moving roaches, big, hardy ones that had only been stunned by our napalm-like fogger. For the most part, though, the problem seemed contained. And then they came back with a vengeance, appearing in places we’d never seen them before. We even got a few of what I call the dinosaur roaches. These are the huge roaches that live in the basement of our apartment building—they’re so big I swear they make noise when they move, like tap dancers. Now that the weather’s nice, they like to sun themselves on the side of the building like insectile iguanas, and if a window is open, they’ll pop in for a visit. We’ve been visited by this particular specimen twice this week. You may have to repeat the fogger when their eggs hatch to get the newbies, too!!! It was probably in the fine print on your fogger!! !